This page will soon show and describe plots of the seasonal precipitation at our stations. 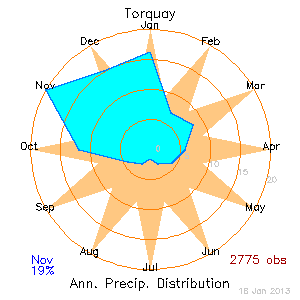 For the moment we are showing monthly total rain in a polar plot with the months arranged clockwise around a circle. The seasonality of the rain fall on Vancouver Island becomes very evident when it is displayed in this way. The largest monthly fraction is written in the bottom left corner. The number of daily totals (observations) is written in the bottom right. The concentric circles, marked with grey numbers, show the fraction of the annual rainfall in percent that each month represents. In the example from Torquay Elementary School, shown below, you can see that almost all (about 65 %) of the rain occurs in the months of October through January. This is Victoria&apos;s rainy season. Thanks to Natasha Ridenour for developing the software to generate these plots. Total rain for each station by month is also available. NOTE: The figure below is not "live" and does not update. It is included by way of example for illustration purposes. Navigate to the station page for the site you are interested in to see an up-to-date figure. This page took 0.7 ms to generate. Last Modified: January 18 2013 11:30:24.